The ancient Persian warriors were soldiers for the Persian Empire during the phases of its military life. The Immortals were the most renowned ancient Persian warriors, feared for their mass scale of attack and the fact that if you were to kill one Persian warrior another one would appear instantaneously giving the appearance of course, that they were indeed immortal. It was during two phases of the Persian Empire, that the immortals were called upon to strike fear into their foes. The Persian army in the Achaemenid period was massive and this was what allowed them to rule over a large portion of the Greater Iran region. The army itself was reported to be up to 150,000 warriors strong, which of course included the legendary Immortals. The Persian army was divided up into to regiments of one thousand men, and these regiments were known as a hazarabam, and ten of these regiments formed a haivarabam of ten thousand Persian warriors. Of course the Immortal division was the most famed haivarabam and were told in history to be the King’s personal division. The Achaemenid Empire was one of the great periods for the Persians and was commonly known as the First Persian Empire. The empire was based on the king at the time, King Achaemenes and the period ranged from 705 BC to around 675 BC. The ancient Persian elite unit the Immortals was formed during this time, and they defended the empire, and attacked also to protect the empire using their elite combat skills. The Sassanid Empire was another great period for the Persians, and ran from 224 CE to 651 CE and is well considered as one of the main powers of central and western Asia for many many centuries. The Empire itself was founded by Ardashir I and once again called upon the skill of the elite Persian warriors known as the Immortals. The Persian Immortals were the heavy infantry for the Persian army, their name stemmed from the fact that if one of the Immortals was to fall in battle, they would be instantly replaced by another warrior. The name itself was coined by Herodotus, the Greek Historian and the Immortals themselves were considered to be ten thousand strong, and were also known as the Zhayedan. An elite fighting unit the Immortals would serve as part of the Sassanid army, and while both the from the Achaemenid and Sassinad empires would be armour and weaponed slightly differently due to the advance in armour and weaponry, their purpose would be essentially the same. The Acheamenid horsemen were an important part of the Persian army of the time, not as heavily armoured as the Sassanian Cataphract warriors, but still formidable, the cavalry would be able to launch shock attacks on their enemies at a moments notice. The Sassanian Cataphract where the Persian cavalry in the Sassanid army. The heavily armoured horse and horsemen would be able blaze shock attacks on their foes, the scale armour afforded them suitable defence against projectile attacks, and the speed at which they would close the distance on the enemy would cause fear and panic in the ranks. The Sparabara were the front line troops of the Persian army, and some of the bravest warriors, despite their limited armoury. Typically armed with a large wicker and animal hide shield, which the Sparabara would use to adsorb projectile attacks, for offensive work, the shield bearers would be armed with a two foot long spear. 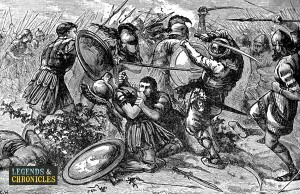 Typically well trained the shield bearers were capable and battle ready warriors. The Persian archers were one of the first lines of attack for the Persian army, they would line up and take cover behind the sheild bearers, raining volleys of arrows down on the opposing force. Lightly armoured to allow full movement to fire their bows, the archers would also carry a range of close combat weapons in case they were forced to engage in melee combat. Widely considered to be some of the best archers of the time, their attacks were considered key in many of the great battle the Persian warriors fought throughout history. The Persian army was so vast, and typically relied on numbers over performance, and this was reflected in their armour, weapons and clothing. The Persian army while roughly uniformed, would be a mix of styles, often dependant on what the individual warrior could afford to buy for themselves, as no weaponry was provided for them. The Persian warriors were skilled in a wide range of weapons and later would themselves adopt some of the superior quality Greek weaponry. The Achaemenid empire warriors would use wicker shield, extremely lightweight and perfect to protect against flying arrows the wicker shields were much less effective in melee combat. In the later Sassanid Empire the Persian warriors would be much more battle ready with regards to their dress. The level of armour and weaponry was far more advanced than the previous Achaemenid empire with more advanced metal armoury and much better quality weaponry. The primary weapons used in the Achaemenid empire were swords, short spears, daggers and bow and arrows. typically the weaponry was of a lower quality then the Greek armies of the time. In the Sassanid period more metal armour was introduced and in particular the cavalry would be much better equipped for prolonged melee and shock attacks. In battle the Persian warriors would be an intimidating force, their sheer number could strike fear in the armies of their foes. With that mass came large scale assaults, and the Persians were fond of projectile attacks, typically bow and arrow barrages. The archers would lie behind a screen of sparabara, the shield bearing troops. From this position the archers could launch volumes of arrows on their enemy while being protected themselves from incoming projectile attacks. Once the enemy had been scattered by the volley of arrow strikes, the Persian cavalry were now ready to launch a shock attack. The cavalry would use their pace to close the battle lines and bring an assault to the reeling troops. In certain cases and in the later Persian empire periods, the Persians would also favour chariot attacks, a typical advancement of the cavalry troops, chariots would allow the Persians to not only launch fighters in close but also allow multiple arrow attacks while closing in on the enemy. 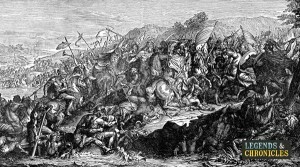 The Persian foot soldiers would be able to slowly close the distance now, they were too heavily armoured and equipped to move with the cavalry, but their armour and range of weaponry allowed them to finish the job in close quarters and in melee attacks. With their huge army, the Persian warriors were a formidable force, the highly skilled and battle winning archers were some of the greatest of the ancient world. The hazarabam fighting units and the combined haivarabam were a sight to behold, and large enough to strike fear into the best trained warriors of the time. 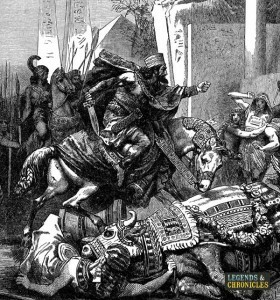 Throw in the shock tactics of the Persian army with their horseback cavalry warriors and the legendary Immortals and the Persians were a force to be reckoned with in the ancient world.